Super soft. High quality sheets. Very happy with this purchase. Give your bed a chic update with this lovely sheet set. 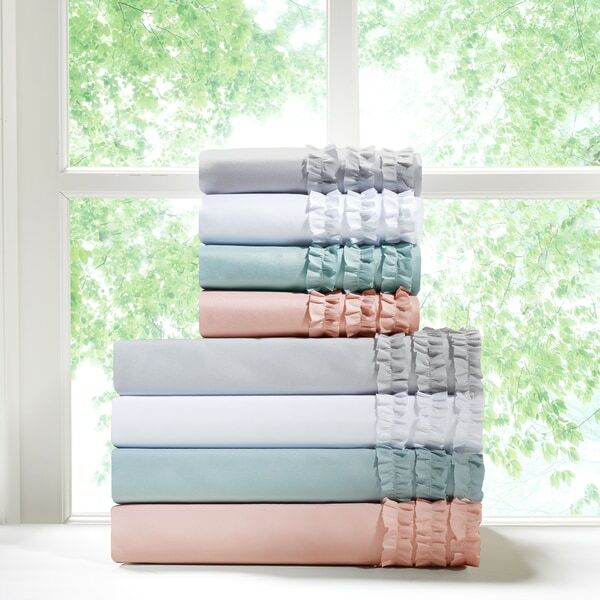 Available in a soft white, grey, pink, or blue, the set features ruffled edges for a charming touch of texture. The soft polyester fabric offers smooth comfort, and the set is machine washable for effortless cleaning. i saw another review that said the pillowcases aren't ruffled, but indeed, they are. i ordered a twin set and it came with 2 pillowcases. i can't believe how unbelievably soft and silky these feel. i will be ordering another set in grey. i wish they offered mint. These really are nice. (fyi - the pink isn't a "girly pink" - nor bubble gum nor pepto bishop: it's a more muted color, closer to blush or a dusty rose. Perfect. I love how soft these sheets are. They are very vintage-like, which I love. I usually never buy sheets, and have been using the same old faded sets forever. I decided to treat myself and these are just so nice. Plus, they washed up very well too. Love the sheets. The ruffles add the perfect amount Of feminine to the bed without too much. Was very excited when sheets came. The color was what I hoped for. I ordered the Cal King which comes with 4 pillow cases, but only 2 had ruffles. Although the fitted bottom sheet was plenty wide enough, would not stay tucked in and was continually popping off. Wasn't worth the hassle of shipping back and I'm using a fitted sheet from a different set altogether in order to use the rest of the set. Would definitely not order again. This set is the perfect muted pink I was looking for. Really nice quality. When sheets are soft and smooth to slide into with a tired body..,all is set for a good night's sleep. I absolutely love these sheets. They are soft,launder well, and look amazing on my bed. The ruffles match the comforter that I bought from Overstock perfectly. They are big enough to completely cover my mattress which is deep and a lot of sheet sets don’t fully cover the mattress and are constantly slipping off. These are actually a little too big which isn’t a problem because I just tuck them under. These sheets actually exceeded my expectations. Very pleased with this purchase and plan on ordering another set! This ruffled sheet set is beautiful. "No, they didn't stink" when I removed them from the package. The ruffles on the edges of the pillow cases, as well as those on the top sheet, were just what I wanted. I ordered them in Mauve, which came in a beautiful pastel hue. They fit my queen-sized bed perfectly and there was no shrinkage after they were laundered. I would purchase them again and have told several of my friends about the great quality. Love these sheets! They are soft and comfortable. They work with any decor. They are officially my daughters favorite set of sheets she has. They were a great buy. I would definitely purchase them again when I need a new set. I just put this on my bed and so I do not know how they will wash and dry. However, they are so pretty and soft. I just love the feel. Super cute sheets!! They look great on my daughters bed. Beautiful sheets. Exactly as described. My Granddaughter loves them! I will be ordering again in several different colors. Great quality for the money. "Please tell me is it a baby pink or a Dusty pink or more to the peach or apricot can you help me with determining if it goes with the ruffle beds that they're selling"
This is a pale dusty pink. Very nice sheets BTW! "In the picture, the pillow cases are presented as having ruffles; a customer review says they do not. Do the pillow cases have ruffles?" Yes, one side of the pillow cases has ruffles. I bought a total of 4 sets of these sheets. Kyle W described it correctly. The ruffles are on one side of each pillowcase '-- the ruffles aren't on both sides (i.e., the circumference of the opening). These are very nice sheet sets - all the ease and low-maintenance/wrinkle-free features of microfiber but they fell smooth, silky, easy to launde, deep'pocketed and oh do comfy. 5 stars. "What is the thread count on these? " These are made of microfiber and do not have a thread count.